Veld are a Blackened Death Metal band from Belarus and they have been working on their new album for a couple years and fans were waiting eagerly for this one after the band released some teasers and singles. They released “S.I.N.” on 15 June 2018 through Listenable Records. Blackened Death Metal itself in my opinion, is a huge grey and vague genre and very hard to pull off well. What Veld do is, produce tight and technical Death Metal with just right Black Metal elements in their riffs and themes. 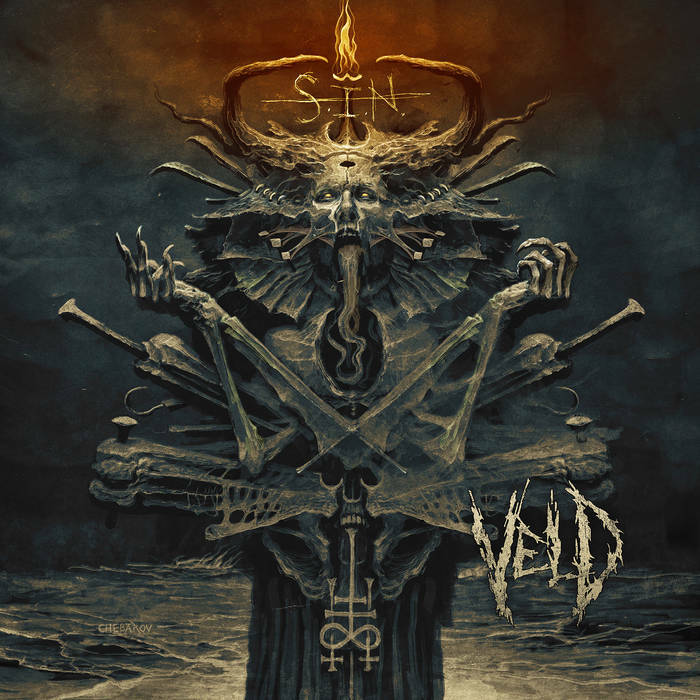 They fuse together the different atmosphere and aggression of both Black Metal and Death Metal to unleash a beast of an album like “S.I.N.” upon the world. They are one of the few bands I can truly call Blackened Death Metal and I cannot praise them ever enough. There is nothing wrong or missing, and the band is like a relentless cannon with non-stop catchy riff after riff. Alongside their own unique style, there is a nice mix of Decapitated-style groovy technical riffs, Behemoth-style blackened riffs and all done just at the right speed. Aside from these influences, Veld remind me of the Metal greats Nile and Nevermore with their hateful atmosphere and technical skill. Like their last album, there are no bad songs, they are all so good it is hard to even pick a preferred song above the rest. The atmospheric intro track ‘The Beginning of Madness’ and one in the middle ‘Awakening’ sets the tone just right for the rest of the songs, instilling a feeling of doom of what is about to come in the actual songs. Usually I have something to complain about on most albums as a fan, but nothing on this one, it is just right. Kirill Bobrik, the frontman of Veld is rapidly becoming my favourite musician and forever has my support. After releasing an insane album in 2015 titled ‘Daemonic: The Art of Dantalian’, my hopes and expectations were high from him, and he did not disappoint. He has slightly changed his guitar riff style on this album, transitioning from an industrial to a slightly old school black style, and bringing something new to the table. The production also brings the same vibes. However, this album is as technical as the last one. The drums are also quite different and organic, well done as expected from Romain Goulon, a star drummer in the Death Metal world. The bass done by Tomasz Wawrzak complements and supports the guitars just right, but maybe he could experiment and solo a bit more. There are some guest contributions as well, such as Karl Sanders (Nile) and Jan Leonowicz (Infestum). Kirill also got the right cover art for his album, it matches with the songs perfectly. Like all albums I usually cover, this one is a must have for every Death Metal fan, and the one of best of their release year, 2018. Thank you Kirill Bobrik for creating music like this, my man.